Summer is long gone and Autumn is on its way out. The long hard winter is almost here, but I just pray the winters here in north California are not as bad as that of New Jersey. I cannot deal with another winter like that. So time to put the barbecue grills away but we could not do so without the one last grill. Since the in-laws are in town one more reason to celebrate. 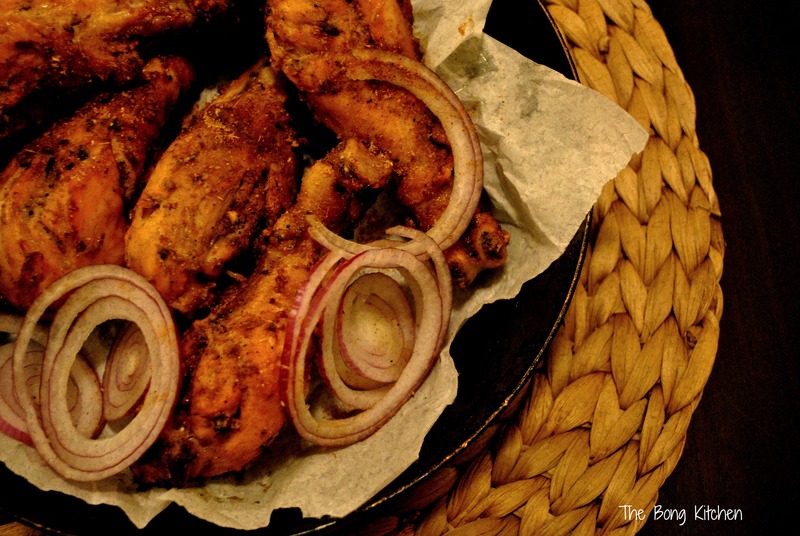 Speaking of grilling, Delhi is full of these unnamed shack like eateries dishing out pipping hot kebabs and Tandoori chicken and pathar ke ghosht ( mutton kebabs) with fresh of the tandoor rotis and roomalis. The whiff of the charred meat with that of that of the handmade bread is heavenly. The long queues of impatient buyers desperately waiting for their share of meat coupled with the shouting and yelling of the cook and the teller and the waiter is a familiar sight in Delhi. Often these eateries wiuld be known as Sham da dhaba, jogider di hatti and so on ( Sham’s dhaba or eatery, Joginder’s shack) and the brightly painted boards would read Tandury Chikan, mooghali khana best in town , (do not mind the spellings) If you are worried about the hygiene then this is not the place for you , Form my own personal experience, I have never fallen ill eating from here, since the food is pipping hot. Well, here in America the closest you can get to a tandoori chicken are the ones they serve in the Indian Restaurants and most of them are an apology for tandoori and taste very very mediocre to say the least. 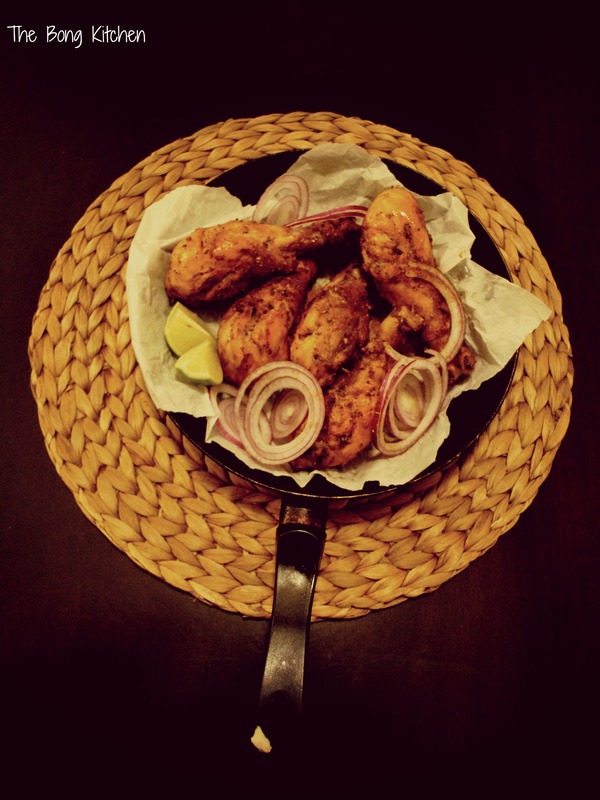 So if you want to have a decent piece of tandoori chicken , it is best you try it at home. It has taken me a while to come up with this recipe , I have had to work my way through it and finally decided to ditch the oven and go the conventional way, i.e. use the charcoal grill. Though the list of ingredients look long and a little intimidating , the process is not that hard. You start by making diagonal slits on to the chicken after skinning it. Next in a non reactive bowl mix all the ingredients under stage 1 with the chicken and leave it to marinate for about 2 hours or so. Now start preparing the marinade for stage 2. First pound all the whole spices and discard the skin of the cardamom. Next in a food processor add the yogurt, cream, pounded spices, powdered spices, salt. Wizz to make it into a fine paste. Now mix it with the already marinated chicken along with the melted butter and leave it to marinate for atleast 18-24 hours. I sometimes do it 48 hours in advance. When you plan to cook the chicken. Light the grill at least an hour prior to that. Let the charcoal heat evenly and the white ash settle with medium flames. Line the chicken on the grill and baste the pieces evenly with oil. Let it cook on one side for about 15 mins. Then turn the chicken and baste it and let it cook for another- 15 mins. You should see charred blackish spots on the meat. 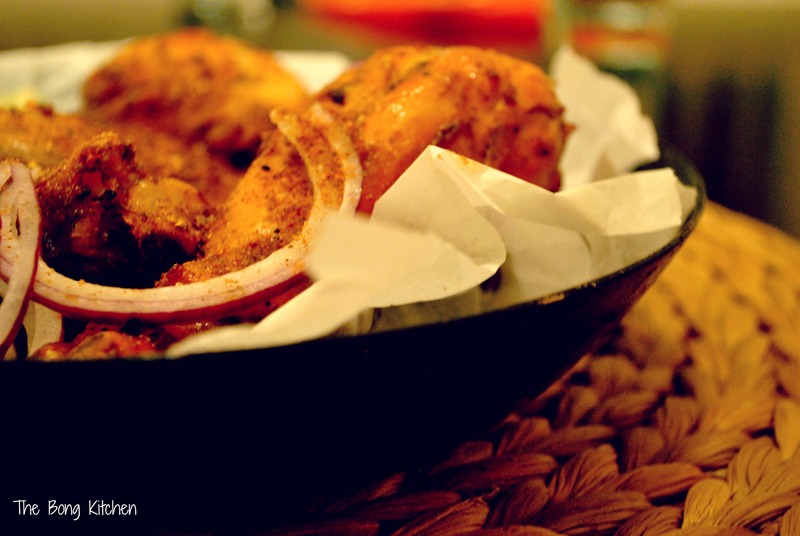 Serve with onion rings and chaat masala and lime wedges. Now if you are cooking in the oven , I suggest heat the oven to about 500 deg Fahrenheit. And it will take about 30 mins to cook but you would have to frequently baste the chicken as the oven tends to dry the meat. You can seer the meat on the gas flame for about 3-4 min a skillet or a griddle pan to get the charred burned look. 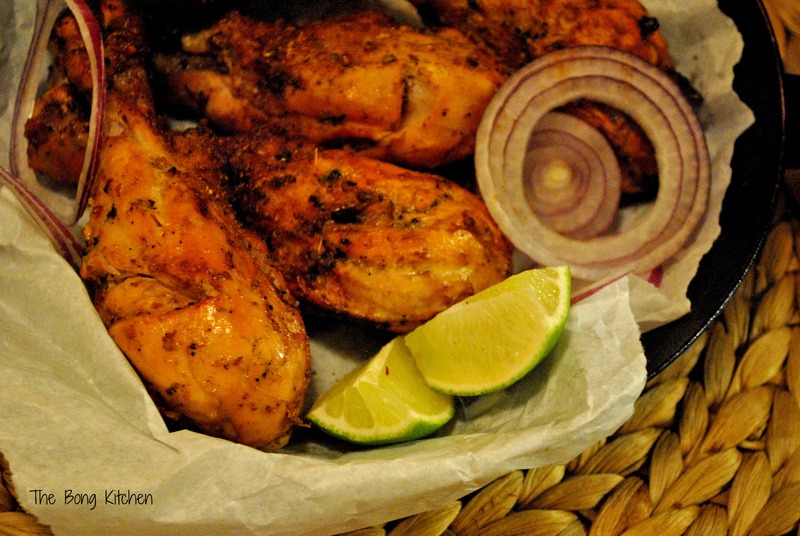 In the stage 2 or marinade if you do not have amchoor you can use chaat masala but adjust according to proportions because it can be a tad too tangy.